A few weeks ago my friends at ES Robbins (the makers of the excellent NHL 94 chair mat) asked me to try out their new website for custom deskpads and chair mats. The timing of this was freaky because I was in the market for a deskpad, thanks to the keyboard scratching up my desk surface. I opted to upload my own design, but it took me several days to decide on what I wanted on my deskpad. Did I want an 8-bit NHL rink? The world map from Avatar: The Last Airbender? A RISK gameboard? A map of Middle Earth or Westeros? A giant Magic: The Gathering playing card? The control panel from the bridge of the Enterprise-D? My detailed plans for world conquest? And on and on. Ultimately I settled on a couple of classic comic book covers. Mainly because it goes with my fancy-pants decor, which is comprised of many Golden Age comics framed in black. Yeah it’s not really all that clever, but it blends in very nicely with the scenery. I’m really impressed with the quality of the deskpad and the finish of the print. It just looks and feels like a premium product. 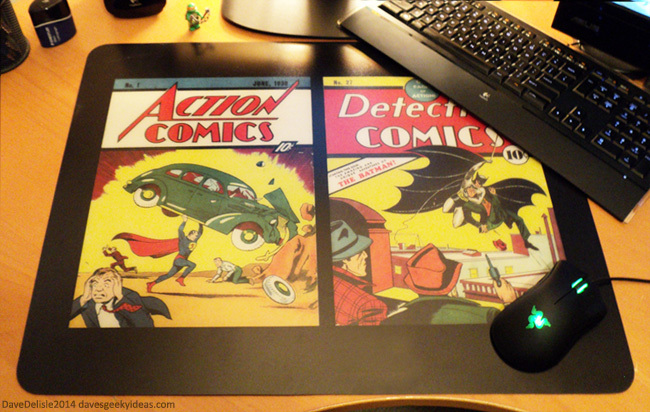 What has really won me over is how smoothly my mouse glides on this deskpad; why haven’t I gotten one of these years ago?? The skinny: they are $38 each (includes shipping), again here is the link. They are only available for US customers (sorry). You can upload your own image or play with the site’s image editor, a few templates are also available. My design was a solid image that covered the entire deskpad, but you can play with transparency/opacity in your design if you’re so inclined; you could create something out of Tron that way (like this). If it’s not apparent already I highly recommend grabbing one of these. It’s an inexpensive way to personalize your workspace. Disclaimer: this custom deskpad was provided to me free-of-charge by ES Robbins. They asked me to test-drive their new website that specialized in custom deskpads and chair mats, in return I would provide feedback on the site and the product. I was not asked to write about this or to provide any sort of promotion. This is 100% me gushing over a custom deskpad. You’re right, though: It is SO hard to choose when you only really need one of something, but have so many interests to choose from. It like trying to choose a shower curtain: do I want the TARDIS one, or the Periodic Table one, or the undersea one, etc. Do I want a lightsaber car antenna, or a Tardis topper? Will my light-switchplate be the Lego one, or the videogame controller one?